Welcome to the UPS power manager home page. 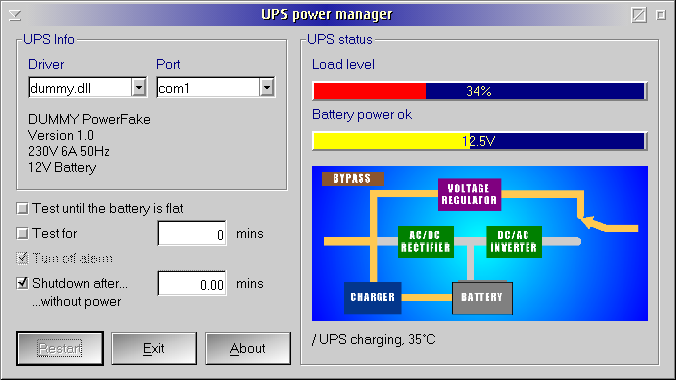 The UPS power manager currently only works with megatec compatible UPS devices. However, the application has been designed to support drivers for a large number of UPS devices. These drivers can be developed by anyone with a knowledge of C programming for OS/2. Example drivers are provided as open source under the GNU lesser public license. The dummy protocol supports no devices, but it is very handy as a driver development template. You can download the UPS power manager for free, but I would ask you to email with information about which UPS device you are using this with, how well it works, and/or which UPS device you would like to have supported next. No feedback equals no further development - you have been warned! A driver flowchart is available here as a pdf document. You may find this useful for driver development.